For macOS High Sierra, follow README.md for High Sierra. NVIDIA GPUs are supported on this version of macOS. For macOS Mojave, follow README.md for High Sierra and README.md for Mojave. NVIDIA GPUs are NOT supported on this version of macOS. Consult this document for debugging and general tips. See the debugging section below and closed issues before opening a new issue. Ubuntu 15.10 running on i5-6500 CPU. Ubuntu 16.10 running on i7-3960X CPU. Fedora 24 running on i5-6500 + i7-6600U CPU. Tested with QEMU 2.4.1, 2.5, 2.6.1, and 2.8. AMD CPU(s) are known to be problematic. AMD FX-8350 works but Phenom II X3 720 does not. A CPU with SSE4.1 support is required for macOS Sierra. Intel VT-x / AMD SVM is required. Download OS X El Capitan or macOS Sierra installer from Apple App Store. Clone this repository. Files included in this repository are needed for ISO creation. Run the ISO creation script create_install_iso.sh included in this repository. Run it with sudo. This script supports specifying the path to OS X / macOS installation application manually via the -a option. Copy the generated ISO from your Mac to your QEMU/KVM machine. Clone this repository again on your QEMU system. Files from this repository are used in the following steps. Install QEMU and other packages. See networking notes to setup guest networking. 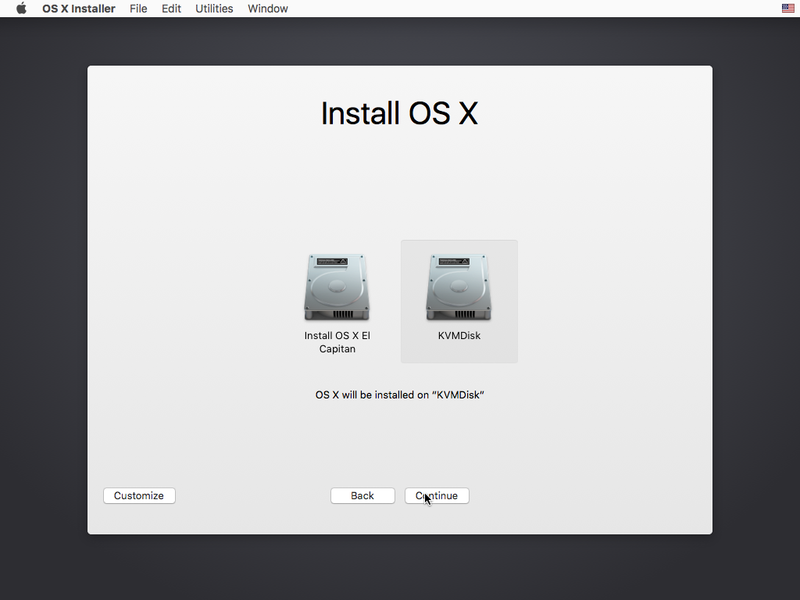 Create a virtual HDD image where the OS X operating system will be installed. If you change the name of the disk image from mac_hdd.img to something else, the boot scripts will need updating to point to the new image name. A base install of OS X needs 10 GiB of space. Adding Xcode or other large software obviously increases that requirement. 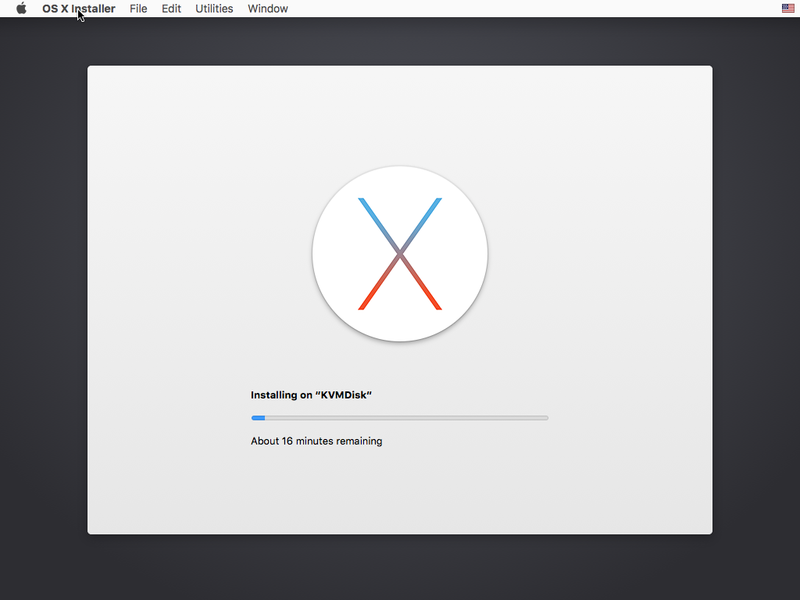 Now you are ready to install OS X / macOS. To install OS X, you can use the included boot-macOS.sh script for a more solid alternate to the following virsh method. Use either the boot-macOS.sh method or the following virsh / virt-manager method to install OS X / macOS. Update: The virt-manager method is no longer recommended, and no support is provided for it. Edit macOS-libvirt.xml file and change file paths for mac_hdd.qcow2 (HDD), Install_OS_X_10.11_El_Capitan.iso (bootable ISO image) and enoch_rev2839_boot suitably. * Start the VM in virt-manager and hit return in the console window. * After booting, the initial language selection should show up. shows "Language Chooser" then see the Debugging section below. When finished, the VM will reboot automatically and the first time setup continues as usual. The boot*.sh scripts have the installation ISO listed in them but this is only required for installation. Once installation is complete, comment out the -device and -drive lines referring to MacDVD and the installation ISO. Inside the guest, you may modify the /Extra/org.chameleon.Boot.plist file to change the default resolution of the virtual screen. See notes for instructions on how to do this and some limitations on the resolution choices. Download a Chameleon wizard such as Chameleon Wizard or Champlist in order to generate a usable smbios.plist. This file goes into /Extra and can be used to assign a reasonable serial number to your virtual Mac. Generating this file sometimes fixes software incompatibilities that occur when the software can't determine what Apple hardware it is running on. For better mouse behavior, install https://github.com/pmj/QemuUSBTablet-OSX and configure QEMU to use the "usb-tablet" absolute pointing device. To get sound on your virtual Mac, see the "Virtual Sound Device" in notes. For macOS Sierra change the CPU model from core2duo to Penryn. The boot-macOS.sh script already has this change. While booting from the macOS Sierra ISO installer, you might get stuck on the "Language Chooser" menu bar (with no option to launch Disk Utility). The solution is to use Ctrl+F2 and arrow keys to navigate the "macOS Installer" menu bar, and to launch the "Disk Utility". This will generate a list of all attached disks. Look for the disk with a size similar to the mac_hdd.img created in an earlier step. Once identified, note the disk number. 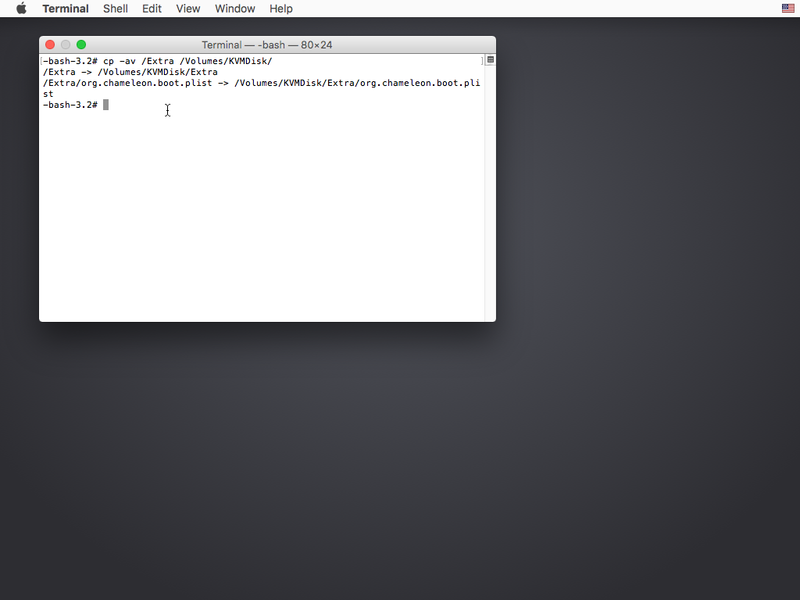 Run a command to initialize the filesystem. Then select your language and click the forward arrow to move to the next step. If you see "hdiutil: attach failed - Resource busy" error message during the ISO creation step, quit the "Install macOS Sierra" program and unmount (eject) the "Install macOS Sierra" device. Disk Utility can help for unmouting disk images. If the App Store doesn't work, check the notes file for instructions on how to solve this. If you are getting "Dont_Steal_MacOS" related errors, see Building QEMU (recommended option) and FakeSMC installation sections in notes file. If the boot process is getting stuck on the Apple logo, upgrade your host kernel and QEMU. For example, Linux 3.16.x from Debian 8 is known to be problematic, whereas Linux 4.9.x with QEMU 2.8.x works fine on the same distribution. The "secret" Apple OSK string is widely available on the Internet. It is also included in a public court document available here. I am not a lawyer but it seems that Apple's attempt(s) to get the OSK string treated as a trade secret did not work out. Due to these reasons, the OSK string is freely included in this repository. Gabriel Somlo also has some thoughts on the legal aspects involved in running macOS under QEMU/KVM.